A friend asked me the secret to shaving as the fed-up Mrs. E had mentioned that I had it down to a science. Which isn’t really the case. No science involved. No art, either. I’m an amateur. What I will admit to is evolving the morning scrape into a more elegant and enjoyable ritual. For as lax as I am about those things that most people take very seriously, I am deadly serious about things that most people consider frivolous. As I began to describe my routine, my friend’s eyes glazed over. It is sort of involved. So for Bill, here is the breakdown of my morning ritual. I begin by taking a very hot shower. At least ten minutes and hot enough to turn my skin a violent pink. Leaving my face wet, I drip over to the sink and hold my badger hair brush under a hot running tap. I know that the brush is wet enough (I think the technical term is “charged”) when I can hold it upside down and a steady stream of water is released. Fill the sink with hot water. While I’m waiting, I start to prepare the lather. I use a cake of shaving soap in a plastic bowl and a sensitive skin cleansing cream (like Cetaphil or Noxema.) A dollop of the cream goes into the silver-plated shaving mug (father-in-law.) I whip some soap onto the brush — much as I would use a whisk to beat eggs. Then I work the lather in the mug until it’s suitably thick and foamy. 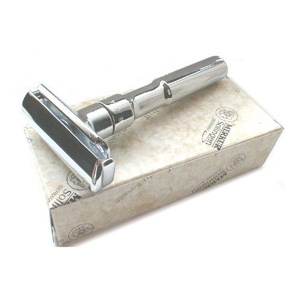 I use a double-edge, adjustable safety razor by Merkur (set at 3) and platinum coated blades when I have time to shave. Both were purchased from ClassicShaving.com The only thing I’m not crazy about is the smooth finish to the razor, which can get slippery in wet hands. Otherwise I speed along with a Mach III, five blade thing that works well enough, but leaves more razor bumps. Now it’s time for the first pass. Yes, the first pass. Of three. This one goes with the grain. And I let the weight of the razor do the work for me. Pressing only irritates my skin and leaves razor burn. Then I wash my face with the cleansing cream and re-lather. If you’ve charged your brush correctly, you shouldn’t have to add more soap to it. The second pass goes across the grain. Again, I wash my face and re-lather. The third pass is against the grain. Then it’s a final wash, a splash of cold water to close the pores and an application of aftershave lotion to rebalance my skin’s Ph. Finally I layer on a top coat of moisturizer and I’m set for the day. Clean the brush and razor under cold water. Hang the brush upside down to dry. If I’m going out with the delightful, but mystified Mrs. E., I repeat the process in the evening, skipping all but one pass to catch the five o’clock shadow. Of course, I tend to get a little OCD about the whole thing and have tried different techniques to catch stray hairs that remain — J-hooking, scrubbing — but I generally wind up bleeding a lot more. Sensitive skin, heavy beard. Sometimes you’ve got to call it a close shave and leave it at that. Aren’t you glad you asked, Bill? This entry was posted in Living and tagged grooming, Living, shaving. Bookmark the permalink. Now I must channel Diana Vreeland’s italics again when I tell you that I understand this-TOTALLY. The 3-pass system is something I thought of as my own obsessive approach until reading this essay, every word of which made perfect sense to me. I only hope you’ve got your own bathroom to dawdle in. It makes all the difference. Pingback: » Blog Archive » A Quick Scrape.